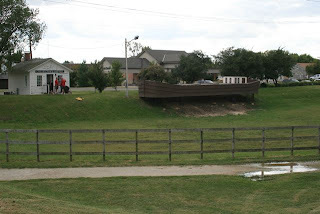 Ottawa citizens have a very good reason to take a keen interest in canal boats: The town is located along the historic course of the Illinois and Michigan Canal. Back in the mid-19th century, the I and M was to this region what the Dragonfly's home waterway, the Erie Canal, was to upstate New York. The 96-mile-long I and M supported westward expansion by connecting the Great Lakes with the Mississippi River. Historians agree Chicago would not have become the great city it is today without the I and M as a transportation corridor. The canal is not as famous as the Erie, but local folks reasonably feel it deserves to be. The state Department of Natural Resources, the Canal Corridor Association, and the National Parks Conservation Association have been involved in protecting and restoring historic canal structures. Our harbor hosts in Ottawa loaned us a 60-minute Ken Burns-style film about the creation of the canal. The filmmakers needed a canal boat as a prop, so . . . they built one! It floated just enough to shoot the film. 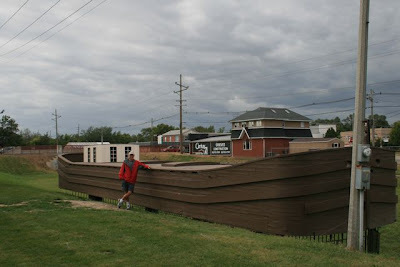 Then the boat went in storage, in a city maintenance shed. And then, that space in the shed was needed for something else. The boat was headed for demolition. Arnie Bandstra, the assistant city engineer, had another idea. 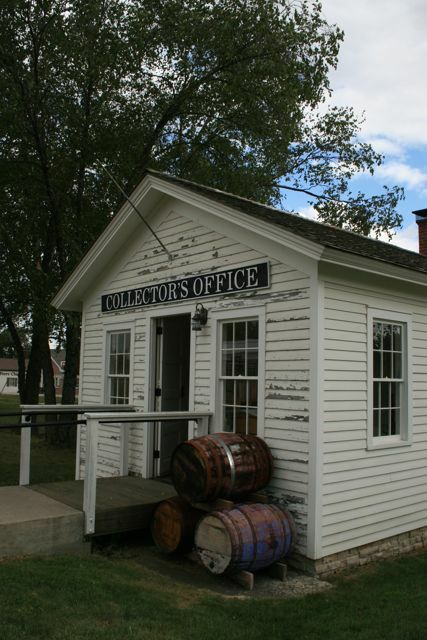 He knew that right in the heart of downtown Ottawa--a stone's throw from the laundromat and a chain restaurant--was the last remaining canal tollbooth, a tiny white clapboard house perched on the edge of the former canal. Why not place the canal boat by the tollhouse . . . and develop the area as an educational resource for local schools? Arnie gave us a personal tour of the site. On his own initiative, he has fixed up the interior of the tollhouse with period artifacts--an old stove, a desk, a rocking chair. An antique map shows the course of the canal through town, back in its heyday. Right now the canal boat Rosalie sits on bare metal struts, but Arnie has plans to camouflage them with tall river grasses. Meanwhile the town is considering “re-watering” this stretch of the canal, to make it a little oasis for canoeing and kayaking right in the heart of downtown. There’s also a delightful bike path along the entire course of the canal. At the tollhouse we met a family from Ottawa--mom, dad, two young boys who are home-schooled--who were biking the length of the canal as a history project. We took our own bikes along the stretch of the canal that runs from Buffalo Run State Park to Ottawa Sunday morning. This bit of canal DOES contain water; it's like traveling back in time. We marveled at the antique locks, made of carefully joined blocks of limestone. The locks seemed tiny, about 20 feet across. Quite a contrast to the massive locks, designed to accommodate big barges, that we've been negotiating for the last few days here on the Illinois River. We visited one other canal boat during our stay in Ottawa. It was in the historic town of La Salle . . . where the I and M Canal joins the Illinois River. The canal boat docked there, the Volunteer, is a replica. You can find her just above Lock 14. 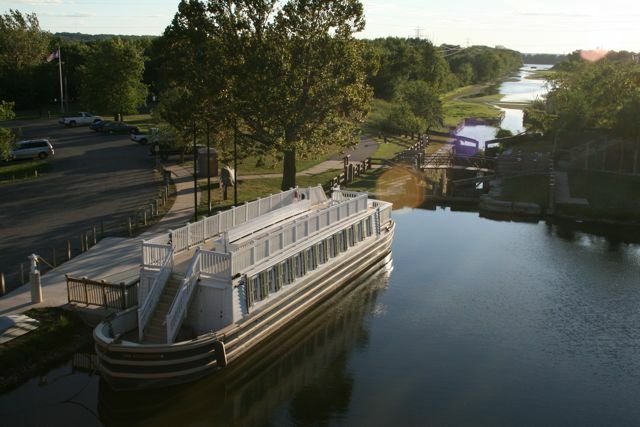 This canal boat is fully functional, and you can take a ride on it! The source of propulsion uses no fossil fuels whatsover: It’s a team of mules. Note: Buffalo Rock State Park ... rock, not run. Good to see you at Starved Rock Marina last weekend.